Corneal Transplantation is a procedure in which a patient’s damaged cornea (the outer clear part of the eye) is removed and replaced with a normal cornea. It can either be a full thickness or partial thickness transplant. DSAEK stands for Descemets Stripping Automated Endothelial Keratoplasty. This is a partial thickness corneal transplant wherein only the innermost layer of the cornea called the endothelial cell layer is replaced. (Descemet’s Membrane is the layer outer to the endothelial cell layer). It is one of the most important advances in the field of corneal transplantation in the last hundred years. It is an outpatient procedure meaning that you would not require over-night hospitalization. You will be given a local anesthetic. A tiny cut is made after which an instrument is used to remove the damaged inner layer of the cornea. The healthy inner layer of a donor’s cornea is then placed in the eye. 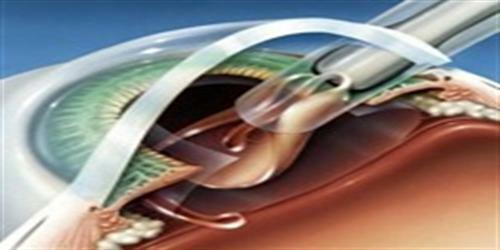 An air bubble is then left in the eye to hold the transplant in place. The small cut is usually closed with a single stitch.